WinHelp is a long dead dinosaur and was soon followed by Microsoft Compiled HTML help files (.CHM) when they released Windows 98. Though it is still supported by Windows 7, .CHM has its share of problems. In 2002, Microsoft released an official statement regarding the security risks associated with the online help format. Microsoft’s official stance on the subject is that they will not be making any future developments to the .CHM format. Window operating systems allow a .chm file to be built using the distributed HTML Help Workshop and this is the most familiar method to most users. 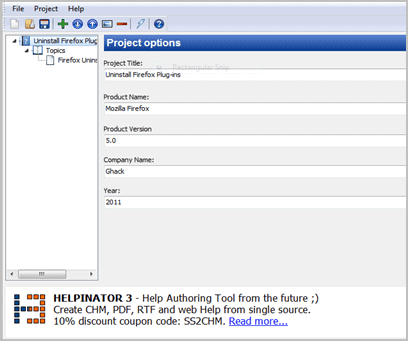 The help utility uses LZX data compression and has a built-in search engine. It allows the user to merge numerous .chm help files with extended character support but it does not support Unicode. The security risks that result from this are caused by the .chm file format which can and frequently does execute arbitrary code. As a result, users across the board have experienced security issues ranging from minor to severe, depending on the executed arbitrary code. This is obviously problematic and can be even more so when networks are involved. Nonetheless, Windows 7 users can still use the HTML Help Workshop to create .chm help files. Compiled HTML help files can also be created using simple screenshots. The utility to achieve this can be obtained as a free download. The time-consuming efforts involved with HTML Workshop can be avoided and .chm help files can be formatted rapidly using screenshots. These can be used for user training purposes or as otherwise seen fit. This article presents a solution that is easy, free, and allows .chm specific help files to be made simply and indexed for easy reference. The software download is small and the file link is clean. There are templates for creating navigation links and product names, versions, company copyrights, and user developed titles can be added as well. Screenshot are added by clicking “+”. Keywords and titles can be altered as needed. 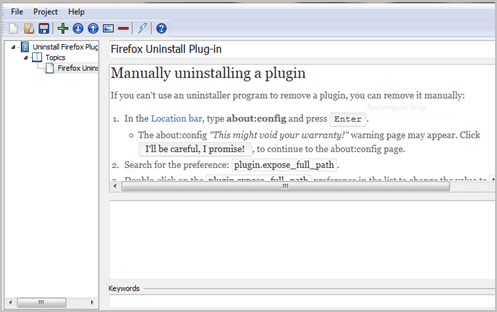 In this image, a screenshot was taken directly from the Firefox Help option and shows the keyword entry field at the bottom. The .chm help file is created after adding the screenshot by clicking the lightning bolt icon in the toolbar and the file is then prepared. It can be found from the Start Menu or from the Helpinator 3 index. That’s all there is to creating .CHM help files from screenshots. Best of all, help files can be made for any program or application in a short period of time. Thanks for this article very useful. Any idea what will replace the chm format for help files ? A help file made out of images? No text search? No automatic resizing of text lines? Nothanks! It’s free, but I think it would be of little use for a serious Help file. @Leslie M: I would think Webhelp. Just put the help files as html somewhere on your web site, and register how often each page is read. Very helpful in determining what pages are read most, which functions may be unclear, etc.